Victoria Oscari, founder of Crafthouse, is one of our favorite craft advocates. 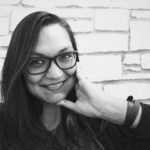 Her crafting social experience, Crafthouse, is celebrating its one year anniversary and what a year it’s been. From their Get Hammered workshop to our own Make My Valentine collaboration, Victoria has been busy keeping locals entertained with fun crafts, good company and the occasional adult beverage. We took a quick #MakerMinute to chat with Victoria, and pick her brain on what makes a successful craft party. Make San Antonio: What are a few essentials to throw a craft party? Victoria: Have a good tutorial, your basic supplies and at least a couple bottles of wine to, um, “fuel” your creativity. Guaranteed fun shall ensue. I always say you can make anything out of my favorite dynamic duo: glue gun and felt. String art. It’s so simple, but it always turns out great. When hosting a craft party what’s more important the glue gun or wine? If you have enough wine, you won’t even notice the glue gun is missing. Trust. How do you get dudes interested in crafting (aside from having beer and/or wine available at your events)? My most popular co-ed events always involve either tools or wood (or both!). I’ve found that guys like to work with their hands and really get in there and make something from nothing. Do you have Pinterest fails you’d like to forget? Yes! I tried making my little guy a fully functional retro camper out of cardboard. I figured it would just be like a giant piñata but my lack of engineering and construction background got the best of me. It functioned long enough for a photo op before completely collapsing! What can we expect for the next year (and, beyond) for Crafthouse? We have soooo many ideas for Crafthouse right now, from neon signs to full-on Halloween makeup tutorials to even a crafty scavenger hunt. The plan right now is to hone those ideas to make sure every event planned is worth attending and each participant is happy with their Crafthouse experience. 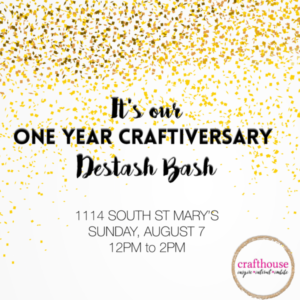 On Sunday, August 7, Crafthouse is celebrating their Craftiversary and christening their new space. The two-hour craft session will allow for guests to choose a craft from several of the projects they’ve completed over the last year (which includes string art, succulent wreaths, wooden beer caddies, hand embroidery hoop art, color blocked wall hanging, stamped/painted tote bags, wood burned cheese boards and linocut carved prints). Supplies are limited so preference will be given in the order of sign up. Or, if you’d like to take a chance and test your luck … we’re giving away a pair of tickets. Comment on this blog entry, or share on Facebook, Twitter or Instagram what’s your go-to craft activity when planning (or, even attending) a craft shindig. On Friday, August 5 we’ll randomly select a winner. Happy crafting! I absolutely adore Crafthouse! Thanks for posting this Jennifer!